38 - £81.99 Only 2 left! 40 - £81.99 Only 9 left! 42 - £81.99 Only 6 left! 44 - £81.99 Only 2 left! 46 - £81.99 Only 4 left! Long sleeves and full length pants get a little stuffy in the summer, don’t they? It makes wearing a suit pretty difficult. You’re standing outside under the hot sun beating down on you, just trying to wear your suit like the classy guy you are and sweat comes pouring out of you while you roast in those long sleeves. But it’d be a downright shame to just hang up your suit for the entire summer, just so you can keep the sun’s rays from cooking you like a goose. Well, do you know what isn’t hot and stuffy? Short sleeves and shorts. They keep you cool even during those summer scorchers. Do you know what else is refreshing on those kinds of days? Ice cream. That frozen creamy treat never fails to delight. So, what did the folks at OppoSuits do? The combined the two things into one great outfit! 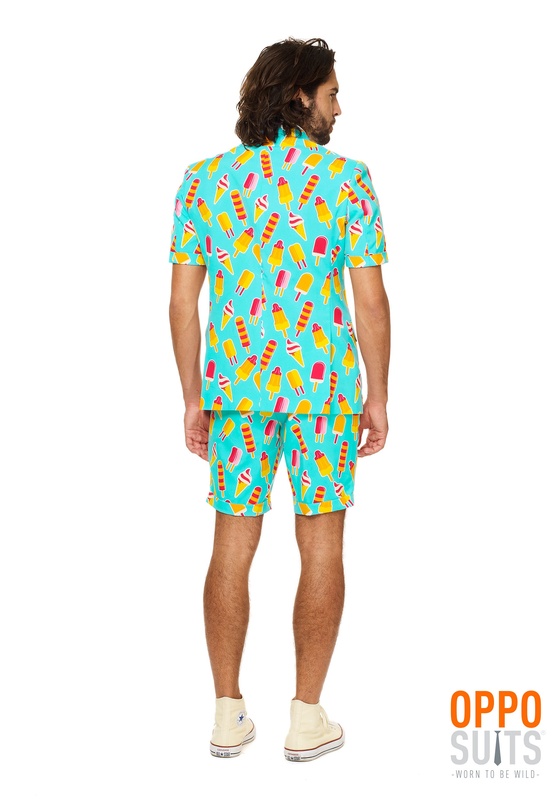 This Iceman Summer OppoSuit has both short sleeves AND ice cream. No worries, since this summer suit is not made of ice cream, but simply has plenty of ice cream designs on it. 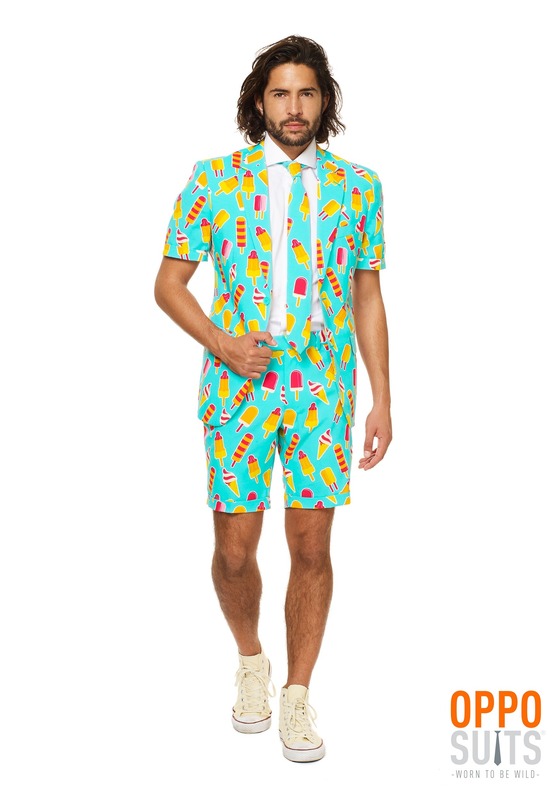 It comes complete with the jacket, shorts and tie, which all match. Now, you’ll finally have a suit that you can wear during those hot days, since this outfit is designed to help keep you cool no matter what! 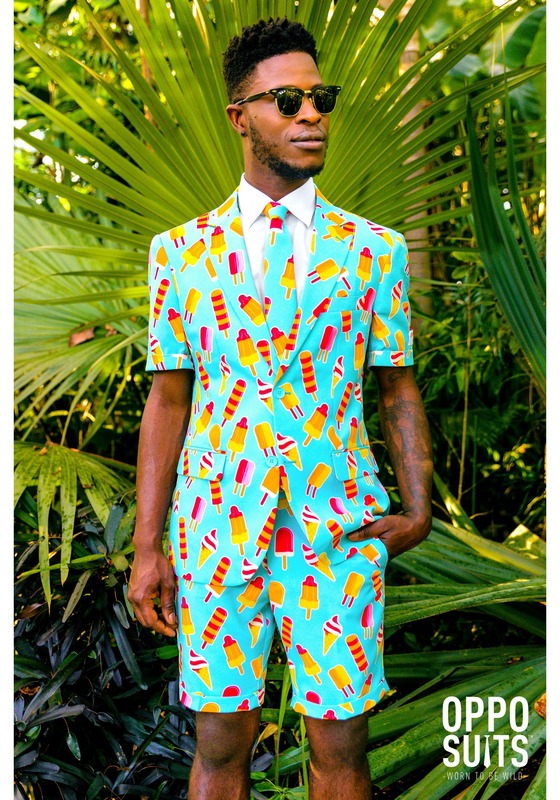 Just be aware, you may quickly gain the summer nickname of “Ice Cream Man” after a few times strolling around the neighborhood wearing this delightful suit from OppoSuits.